Augustus (“Gus”) Alexander Clewell (1845-1911) was the son of John David Clewell (1804-1862) and Dorothea Matilda Schltz (1815-1908) of Salem, Forsyth County, North Carolina. 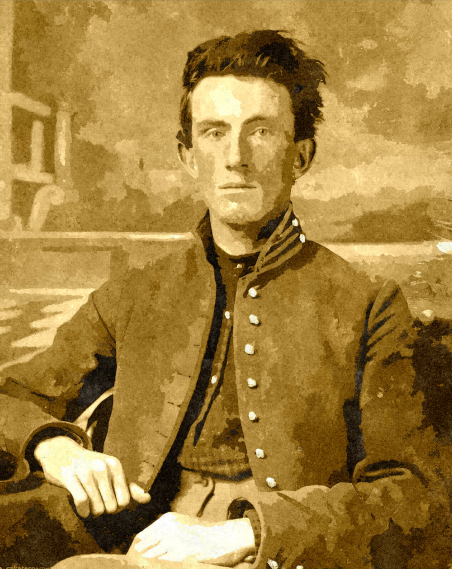 Gus served his country during the Civil War, enlisting as a Private on 24 May 1861 in Company E, 21st Infantry Regiment (Confederate) of North Carolina. He was transferred into Company B, 1st Battalion Sharpshooters Regiment North Carolina on 26 Apr 1862. Augustus was noted as serving his country as a distinguished and daring Scout. After the war, Gus was a practicing Physician for 30 years. He had an office of Allopathic Medicine on the corner of Harford & Lafayette Avenues in Baltimore, Maryland. 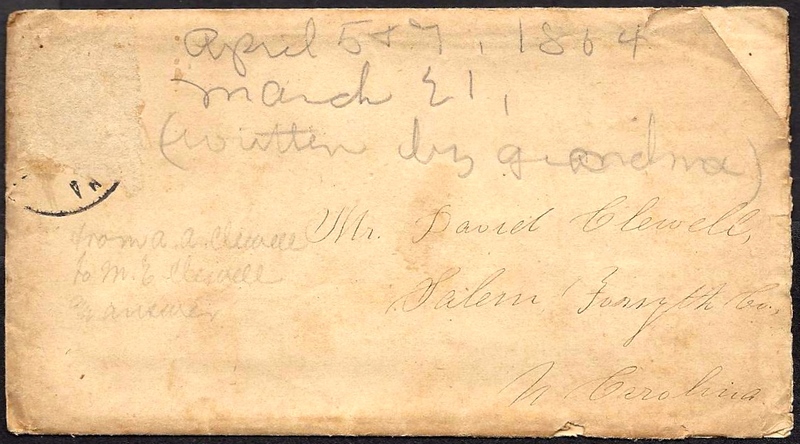 In 1866, apparently Gus attempted to make a living in Kansas City, Missouri, and I found a very interesting letter on-line he wrote his mother from that location (see footnotes). There are four letters in this collection. 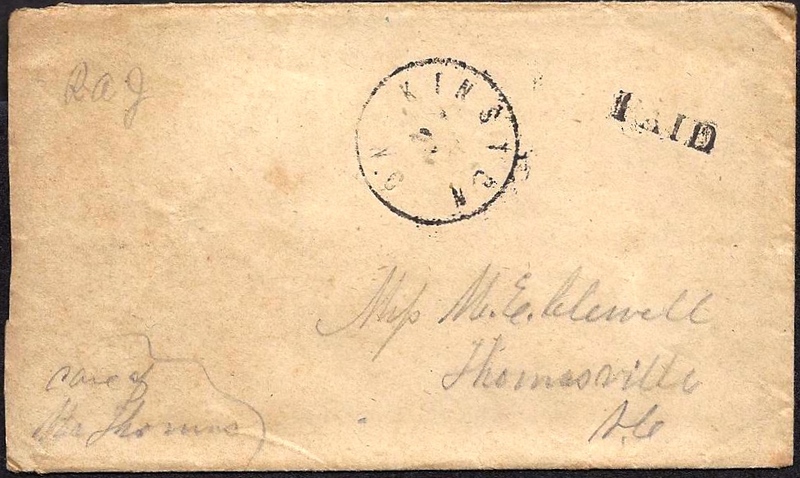 The first letter was written by Margaret Elizabeth Clewell (1840-1930) to her brother Gus upon hearing that he had decided to return to military service. 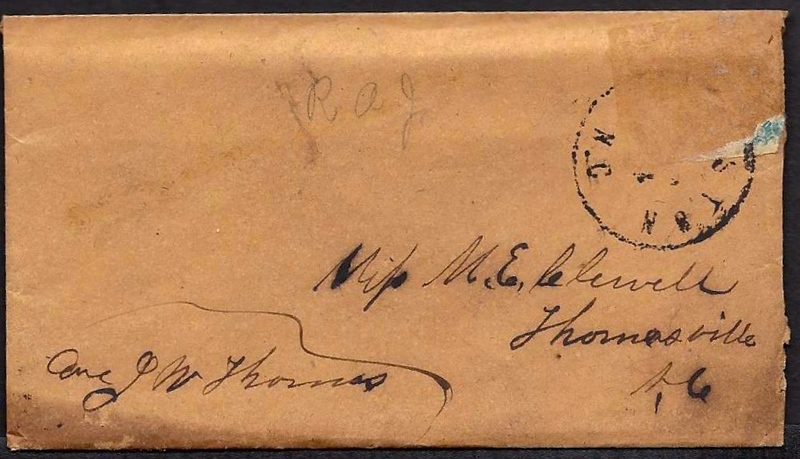 The second letter was written by Gus to his mother upon arrival in Kingston, North Carolina where the 1st Battalion N.C. Sharp Shooters were camped on the banks of the Neuce River. The third and fourth letters, I believe, were written by Robert A. Jenkins (1839-1917) who married Margaret (“Maggie”) Elizabeth Clewell in 1867. I have just written to sis with a pencil & do the same to you for its too cold to have the fires. I was much astonished to hear you had left M. & were going to the army. What does mother say? My opinion about it is that you know your own business best, but I would like to know if you were obliged to go, or if you only go because you want to. I would have liked if you could have contented yourself in Raleigh (provided, of course, you could have staid) and to say I don’t care that you are going would be a story. But I am willing you should go since you are so bent on it. I hope mother is too. Is your friend Bones going also? I think you & he fixed up that letter of Ann’s to fool her. I have written to you at Raleigh. I suppose you have the letter by this time. It would be a great [shame?] if the letter were lost as Miss Carrie sent you a very valuable gift in answer for your letter. Please write to me soon & tell me where & when you are going. And don’t be so stingy with your pen ink & paper. You don’t like long letters so I am through. As I told you when I left home I shall try and keep account of all the important events which transpire while I am in the army, but before doing so, you’ll want to know how we are getting along and so I’ll tell you. I arrived here safely on Tuesday evening and met several of our company at the depot, all of whom I was very glad to see. When I got to camp, I found the men comfortably situated on the banks of the [Neuse] River, every tent having a fireplace so that on a rainy day we can sit before the fire in the dry. All have plenty to eat and a better, satisfied crowd I never saw. The rations that we draw are plenty and I have heard no complains at all. I am glad that I came and wouldn’t go back to Raleigh for anything again during the war to work at the printing business. The river is up at present so that we cannot fish, but is falling rapidly and in a few days we’ll go fishing. Since I’ve been here, I have went wherever I pleased — no guard around the camp at all. But there is no place about but what is not duller than camp so that I stay here mostly. There are small boats on the river and we occasionally amuse ourselves by going and taking a ride up the river. I was surprised to find everything as it is, and I’m only sorry that I didn’t come sooner. The soldiers all look healthier and stouter than when I left and all are better satisfied. As far as suffering for anything to eat is concerned, its all foolish talk. There is not a man but what has as much as he wants. Yesterday morning for breakfast, one of the mess baked splendid cornbread and fried a pan full of No. 1 meat, and I enjoyed it as well as any meal I ever eat. You can rest assured that I’ll tell you nothing but the [truth], and what I have written I would be willing to swear to. I am very well aware of the difficulty in attempting to keep a journal of all the important events which come under my own observation or in which I am personally concerned, but hoping to succeed in my undertaking, I shall never under any circumstances record any falsehoods or exaggerate any incident with the view of making it appear in a different light. If anyone ever does the writer the honor to peruse his journal and finds portions of it mixed in such a manner tho’ it cannot be well understood, let the reader take into consideration that a private soldier hasn’t the time and conveniences necessary for an undertaking of this kind. Kingston, North Carolina, April 5th, 1864. After a very disagreeable journey of twenty-four hours, I arrived at Kingston and immediately proceeded to camp. When reached there, I was several times reminded that I had on a white shirt by being told on several occasions to “come out of that white shirt” which I did in a short time. I attached myself to Co. B, 1st Battery, North Carolina Sharp Shooters where I shall undoubtedly remain during the war. Everything is quiet — no excitement at all in camp, so I shall go to bed. April 7th. Everything quiet still. Nothing important transpiring today. I visited the field where the twenty-two deserters were executed for the double crime of desertion and bearing arms against their countrymen. ¹ The gallows on which they were hung are still standing in the edge of Kingston. ¹ See: Kingston Hangings ordered by Gen. George Pickett. Gen. George Pickett’s decision to order the hanging of Confederate Deserters who later joined the Union army almost resulted in his trial as a war criminal. On the banks of the clear, winding Neuce, day after day do I think tenderly and fondly of you, my much beloved sister. But today of all others my mind dwells upon the scene in which I imagine you moving and my heart follows your actions with the deepest interest — imagining I see you in Salem moving up the street and crossing to the other side, entering a house with a long porch in front, a haying basket at each end, and in which dwell a heart for whose happiness I ___ so gladly — nay proudly — devote my whole life. And yet she doubts me, sad thought, could she but know the truth. Know how this terrible suspense grieves me, twould make her sad, but these things I shall keep concealed from her. This is the Holy Sabbath but the doors of God’s temple are shut to me as there stern duties of camp require that we shall be at our post, but my heart will be with you in your worship. When you het back to ___, write me all the news and don’t heave out any particulars for you don’t know how much I love to read your letters and I have received only one since I left home and I think this is my fourth one to you. The last and only one from you is still in my care and keeping and I read it over every day with great pleasure. I shall destroy it when I get another. Brother G. is not with me. He will come in the third ___ which will be in the field in January should we be relieved in thirty days. Should we be, it will be about the twelfth of next month when our time is out and I hope I may be able to go direct from here to to Salem and from there home. Since you think it best, I should not come to T. though I assure you it will be quite a trial to me to come so near and not see you. I have not written to her yet and almost fear to do ao. Must I do it and if so, what must I say? I have been thinking that I would simply ask the pleasure of visiting all only way home. Tell me what to do. I have only written home once since I left. The First Battalion has gone to the Valley. We camped on their old grounds a night or two ago. Are any of your friends from Salem down here in the Home Guard or any of C. Give me their names. I would like to see them and form their acquaintance provided you do not object. It will amuse you to see my situation at this time, sitting (or rather reclining) under a pine board shelter with eight or ten men all round — some writing, others talking and nearly all dozing, and I would be in the same predicament were it not that I was thinking so much of you and some ____ that I can not doze. I have been suffering very much the last two days with a very good cold but today I feel a good deal better. Last night I made me a stew of pepper which did me some good though I think the remedy was worse than the disease. You must excuse my bad letters — especially this. Let me hear from you often. Write long letters and tell all the particulars for in so doing, you will favor one of your ____ and best friends. It is possible you may be surprised at receiving another letter from me at this place but so it is. Though we are still living in hopes of a speedy relief, were it not for one thing, I could stay here with the greatest comfort and ease until Christmas and then I should want to go to Salem and spend a week in the company of those who are dear to me. Yet I think it best to go there immediately for I think I never wanted to see any one in all my life half as much as I want to see me in Salem. I did not believe I was capable of loving so tenderly and truly. O God, may that love be returned. We are having a rainy day. The clouds are dark and lowering and bids fair to have a long spell. It was thought night before last that we would have a fight. The alarm was given and we were thrown in the trenches. It all turned out to be a little picket firing and we came back to our camp about midnight. There are various speculations in camp today as to our disbanding. One report says tomorrow and others place it at each day in the week. I think it probable it will be Thursday if at all. Whenever it is, I shall go to Salem if possible and spend a day or two before going home though the home folks may think hard of me for it. I will also have to stay in Raleigh one day before I go to Salem as my trunk is at the exchange and in order to get some of the smoke and dust off me before going to that dearest spot on earth to me (Salem). I shall wire you as soon as we are relieved so that you can know where I am. Would that I could hear from you in meantime. I hope I may find all well in Salem when I get there and also find Frank exchanged as they are exchanging very ___ by now. Col. Royton’s son has been exchanged and is now at home. I wish you would wire to me at Salem and tell Anna to keep it for me until I come if you think it will do no harm. If you do, wire to the exchange and I will get it as I go or return through Raleigh. I have neglected writing to you for some time, but guess you don’t care. One reason for my negligence is that I know of nothing that is interesting, and know you don’t care about getting a half sheet or less. There is not much new anywhere, the war being ended, local items, unless some one has been killed, or a street row, where half dozen homes have been pulled down, are considered of no importance. We have had nothing of the kind in this place, everything working quite smoothly, with the exception of a continual quarreling between the copperhead, as they are called, and the radicals, but nothing serious come out of it. Across the line, in Kansas, a man was lynched, hung for being one of the gang of horse thieves and murderers Saturday. A great many desperate characters have been strolling through this county, like every newly settled section, but the authorities are making it too hot for them. Many have been arrested, and the others are leaving fast. I have some warm friends here, but for all that I must say that I do not like the place or people. There is much a mixture – every State in the Union, and most of the European powers are here represented, and in passing along the streets, four or five languages can be heard. There are more Irish, I think, than any one other people here, but a great many Germans also. The Germans here, like every where else, make themselves odious (foreign born) on account of their obstinate, domineering spirit. There are more drinking saloons in this City than can be found in the who northwestern portion of North Carolina, and all well patronized. Within a few miles of here, quite a number of Indians live, but like the Cherokees in the southwestern corner of N.C., they have become civilized. Men and squaws can be seen on the streets daily, not a great many, and some the hardest looking specimens of humanity I ever cast my eyes on. I have heard and read much about beautiful Indians girls, but I have [yet] them to see. Some quarter breeds are very pretty, but the full blooded Indians are worse looking than the negroes, those that I have seen. The Indians I attend to are the Wyandotte tribe, only a remnant of which now extinct. We have had real Spring weather, nice and warm, but it has been so windy that a person is almost blowed over sometimes. The citizens tell me that the wind blows almost constantly all summer, which I think is true, finding from the past few weeks. The grain and trees are putting forth, and in another month everything will be green, and flowers blooming. Of course you must take in consideration that this is two and a half degrees farther north than Salem, which makes the Spring later. When you write, tell me what has been done with Captain Wilson, as I am very anxious to know. I did not receive the Press you sent me and although would like to see, it makes no difference. I have sent you a Santa Fe paper, with a portion of the reading matter in the Spanish language. S. Fe is about a thousand miles across the Plains and will be of not much interest, but curiously perhaps. Give my love to all and write soon. This entry was posted on Sunday, September 14th, 2014 at 4:27 pm	and posted in Uncategorized. You can follow any responses to this entry through the RSS 2.0 feed.